Shallow Thoughts » What will become of Mugsy? What will become of Mugsy? At the November Cleveland Web Standards Association meetup, Brad Colbow shared with approximately 40 attendees how he goes about styling a website using CSS. He was the third presenter since we started having monthly workshops as a group. Considering that he was preceded by Eric Meyer and Jason Morrison during earlier meetups, Brad really held his own as a presenter. If you are interested in the content of his presentation, you can view the files at his blog, and read Dana’s recap. What I’m writing about is the November meetup tragedy. Eric Wiley and his faithful friend Mugsy were parted for the first time in 8 years. 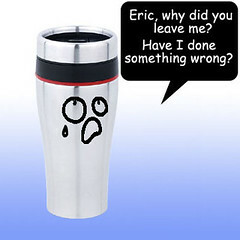 It’s a heart wrenching tale that continues to unfold about a man and his mug. be an abandoned 8 year old mug. He’s in unfamiliar surroundings. God only knows who has fondled the slightly dented aluminum exterior! I shudder just thinking about it. I imagine that the poor little drink dispenser might be so distraught over having been left behind in such a callous manner, that he could do something drastic. Subscribe to comments with RSS or TrackBack to 'What will become of Mugsy?'. Allo! A little coffee mug passed through here a few days back. Mumbled something about “Tri-C, Ohio and the Cleveland Web Standards Asocciation”. Did a bit of poking around and found your site. Wonderful! The mug was heading towards the train tracks last I saw.